Durham Police have launched a review of the Metropolitan Police's phone-hacking inquiry, Scotland Yard has announced. The move comes after a request from the Met's incoming commissioner, Bernard Hogan-Howe. Mr Hogan-Howe earlier told members of the Metropolitan Police Authority (MPA) that the police's relationship with the media had "gone too far". He said he would reset the boundaries between the police and media following the phone-hacking inquiry. The review into Operation Weeting - the police's phone-hacking inquiry - was ordered by Mr Hogan-Howe when he was acting deputy commissioner of the Met in the summer. Scotland Yard said it was considered best practice for outside forces to review major and sensitive investigations of this kind. The review will be led by Durham Constabulary Chief Constable Jon Stoddart, who will report back his findings to the Met. 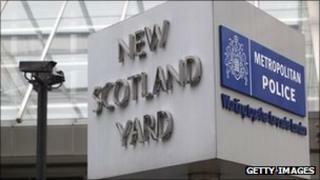 A Scotland Yard spokesman said: "We can confirm that the Metropolitan Police Service has asked an outside police service to conduct a review of Operation Weeting." Addressing members of the MPA for the first time at City Hall in London, Mr Hogan-Howe called for an era of transparency and austerity. He said new guidelines would be issued for police officers associating with journalists. "I don't think anyone is going to argue that the police service should not have a relationship with the media, he told authority members. "But it's clear that this relationship needs to have a resetting of the boundaries between us and how we manage that interface." Mr Hogan-Howe said standard operating procedures for officers would be updated at the conclusion of several inquiries, following allegations of police corruption surrounding activities by journalists at the News of the World. Lord Leveson's inquiry into press practices will "inquire into the extent to which the police received corrupt payments or other inducements, or were otherwise complicit in such misconduct or in suppressing its proper investigation".